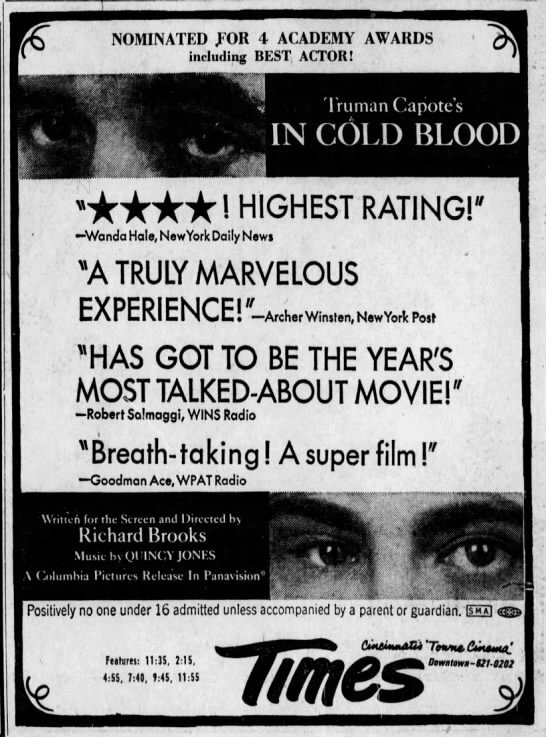 It seems it was right around this time, 50 years ago, that my mother - for a reason I no longer remember - treated me one night to any downtown movie of my choice. We took a taxi downtown and everything. After seeing that the International 70 was showing CUSTER OF THE WEST and the Albee was showing GUESS WHO'S COMING TO DINNER?, I chose the feature showing at the Times. It was advertised as being inappropriate for children my age, but I was accompanied by a parent. In retrospect, it was the best choice on the table, but it was also kind of like walking into an explosion. Black-and-white. Panavision. Docudrama. Two unknown leads. Shotguns and rubber gloves. No "The End." I'd been going to horror films most of my life, most often alone, but I had never been so frightened by a movie. I didn't know movies could do that to a person, emotionally. I wasn't really yet aware that there were people like that. I walked out of the theater into a different world, with a different comprehension of the world. I was shaken up for days, even though I'd hidden my eyes during the murder scene - the last time I ever hid my eyes at the movies. I saw IN COLD BLOOD twice more within the next year or two (until I finally saw all of it), and I also read Truman Capote's book - trying to get a handle on the experience. If a lifetime of watching movies has taught me anything, it's that you don't get a handle on the combination of Richard Brooks, Conrad Hall, and Quincy Jones. You light the fuse and run.